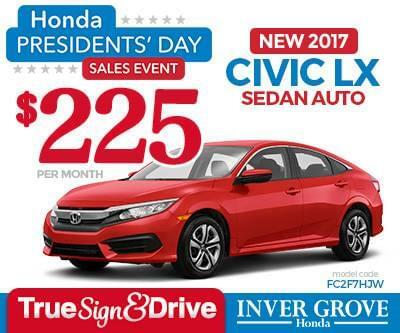 Find New Honda Civic Lease Specials in the Minneapolis MN, St. Paul, Burnsville & Inver Grove Heights, Minnesota area. 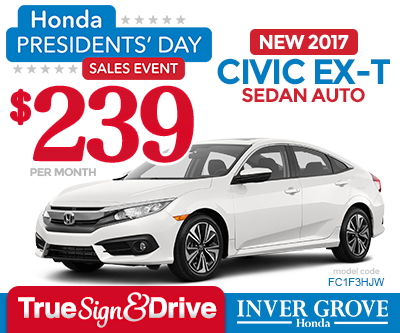 Browse our New Honda Civic Sedan, Coupe, and Hatchback specials at Inver Grove Honda where you will find the New 2016 and 2017 Honda Civic you are looking for. 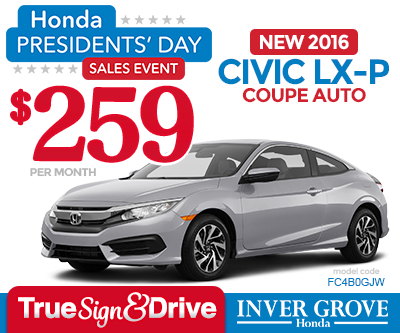 *2016 Honda Civic LX-P Coupe Automatic. 36 month 36,000 mile lease. $0 due at signing, $0 down payment, dealer makes first payment, includes taxes, title, license and dealer fees. See dealer for complete details. 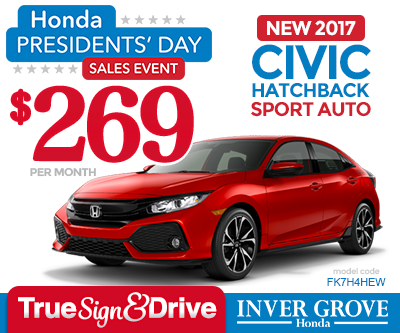 *2017 Honda Civic LX 2.0L Sedan Automatic. 36 month 36,000 mile lease. $0 due at signing, $0 down payment, dealer makes first payment, includes taxes, title, license and dealer fees. See dealer for complete details. *2017 Honda Civic EX-T Sedan Automatic. 36 month 36,000 mile lease. $0 due at signing, $0 down payment, dealer makes first payment, includes taxes, title, license and dealer fees. See dealer for complete details. *2017 Honda Civic Hatchback Sport Automatic. 36 month 36,000 mile lease. $0 due at signing, $0 down payment, dealer makes first payment, includes taxes, title, license and dealer fees. See dealer for complete details. You can apply online for a car loan from Inver Grove Honda with our online Finance Application Form. It’s secure, and when we receive the application, our experienced and helpful staff will review your application, and contact you as soon as possible.